Getting to Know your Drag Radials! If you like going to the drag strip you are certainly no stranger to the various types of drag radials or slicks people run. What you might not know is how someone came to decide what would be the best tire for their application. When researching what would be the best drag radial for our ATS-V we knew that we wanted something that we could drive both on the street and on the track. 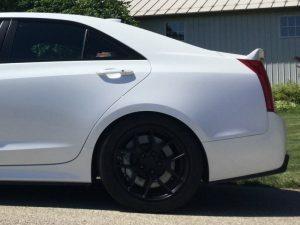 While we wouldn’t be driving these tires on the street that often, our ATS-V is no trailer queen and we drive it to and from the drag strip every time we go. Because of that we selected Mickey Thompson ET Street R, P275/40R17s as our drag radials. These do exactly what we need on the drag strip and handle regular street driving just as well. Something interesting we focused on while researching the best tire for us was that Mickey Thompson recommends a different drag tire for a manual versus an automatic. For an automatic you want your tire to dead hook because the torque converter prevents the motor from bogging and provide a less violent launch. But in the case of a manual transmission as we have in our ATS-V, a slight amount of controlled spin is preferable because a dead hook can bog down the motor or shake the tires. If you execute this correctly it will allow for the right amount of wheel speed and traction so that you can continue to rapidly accelerate while going through the gears. What differentiates our M/T ET Street R’s from their regular ET Streets is that the R allows for more flex in the sidewall. This allows the tire to absorb some of the shock from the launch. Ideally you would want a bias ply for a manual transmission car as the tire is able to “wrinkle” at launch, far more than a radial tire can. However you do not want to mix bias plys in the rear with radials up front as the car will not track well at all. The next tire upgrade we will have for our ATS-V next year is a set of bias-ply slicks with skinnies up front. These are all important factors when considering the best tires for your drag racing applications. If you want to put down the best times at the track you have to know what the best tires for your specific vehicle are. We have had an absolute blast taking our ATS-V to the drag strip and having the right tires has made it that much more fun!